Okay now this is pretty funky but cute. Take a look at this retro owl sunglasses case you an make. She also has a few other freebies there like a ladybug stitchery, ladybug pincushion and more. I just happened to come across an owl cross-stitch pattern. Not that I am likely to do it as cross-stitch has never been my thing, but somebody out there in blogland must love owls and love doing cross-stitch. This blog has a heap of other freebies for cross stitch to grab too. Burda has lots of freebies to grab. You will need to register but it is quick and painless. Bags, hats, dresses, shirts, skirts...lots of goodies to grab. Skip To My Lou has a tutorial for a nice fabric notebook cover. Better Homes and Gardens has nice 3 fold wallet to make with zipper for coins and credit card slots. Nicole has a laptop sleeve to grab if you need something to carry your laptop around in. She also has a heap of tips and instructions on bag making there. This tutorial doesnt have a free pattern but it really is a great tutorial showing how simple it is to make a Raggedy Anne doll....very clear instructions and it will also give you ideas to make your raggedy anne pattern slightly different to what you may have done before. Heaps of links on Alexandria's blog for cross-stitch patterns. Laura Lynn has a cute Santa Teddy freebie for the Teddy Bear lovers to grab. Take a look at all the other freebies while your there. A basic pattern for a felt needle keeper that would be quick to whip up can be found over here. Ruthann has some free baltimore quilt patterns to grab here. Marnie has a great idea to make a nice easy pincushion using a wide wooden candle base. She also has a great storage idea and tutorial to make altered tin storage buckets. All People Quilt have a Covered Journal freebie to grab. Better Homes and Gardens have a cute wildflower pincushion tutorial. Better Homes and Gardens has a freebie classical look Clutch Purse tutorial here. Jcaroline creative has a bag called Hobo Bag with a good tutorial on how to make it. If you go here you will also find a heap more freebies. Gosh I havent had a chance to look through them all to know if there is anything more worth making, but if you find something let me know. Larissa over at mmmcrafts has a cool kitty applique pattern you could use for all sorts of projects. She also has the cutest softie called Molly Monkey to grab. Bird Brain Designs have some terrific stitchery freebies to grab. Freebie Gallery has heaps and heaps of cross-stitch pattern links for all you stitchers out there. Mary Engelbreit has some cute little flowers and baskets to cross-stitch. If you go to the free colouring pages you could use her cute drawings for stitcheries too. I must admit I dont seem to have the patience for cross-stitch but if I did these freebies would be lovely to do over at Mausimoms. She has freebies every month by the look of it. Projects galore can be found at Spotlight Australia.Quilts, aprons, beanbags, bags, cushions and so much more. This origami purse/pouch over at Quiltcetera is so cute and looks so easy to whip up. Quilting Treasures have a heap of freebies. Quilts, totes, taberunners, apron, drawstring bags and more. Fabric Freedom has a huge range of freebies to grab. Quilts, tablerunners, totes, cushions and even little dresses. To get 6 months free online Downunder Quilts magazine you can sign up here. Tallgrass Prarie Studio have a tutorial for wonky blocks that look great made up into a quilt. My Quilt Corner has some free stitcheries to grab for you redwork or embroidery projects. I love the bees and hive. This is a great link for doing pieced heart quilts. Delaware Quilts has the heart block instructions for all size blocks. Susies Country Garden has a heap of great tutorials for different things...purses, totes, luggage tags and more. Redwork patterns can be grabbed over at Redwork. You an do them in any colour you wish of course. You can grab some applique patterns with a 30's theme over at Quilters By Design. Heather Bailey has a freebie called Square Deal Pincushion. I used this one to perch my cute little owl on. Take a look here to see. Okay this is pretty nifty. 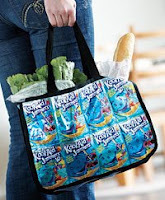 Now I dont know if I will ever make it as I dont think I have seen this kind of juice bags here in Oz but for the girls in the States take a look at this tote bag made from juice bags. This is the neatest mason jar pincushion. You can keep all your bits and bobs in the jar and have a handy pincushion....love it. This is really nifty to make a continuous row of prarie points for your quilts. You have to take a look at this. Crazy Mom Quilts has a lovely bright crisp quilt to make using 2 simple blocks. Take a look at the finished quilt here and to get the block construction go here. A great idea to use a loved T-shirt that you cant bear to throw away. Recylce it and make a tote bag. Freebie pattern over at Coats and Clark. They also have a couple of other totes and a lunch sack here. 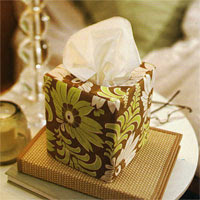 Coats and Clark have a free fabric basket pattern. I can see this with some square coasters in it or because I am going owl crazy a heap of cute little owls sitting in it. Fat Cat Designs have some terrific patterns over there. You could use them for stitcheries and embroideries. Sew Christine has a tutorial for a smaller wallet with zippered coin pocket and room for a couple of credit cards. She also has an easy nappy/diaper bag....or really just an easy tote bag tutorial. A very simple felt needlebook can be found over at Duo Fibreworks. You could whip these up very quickly. The perfect little owl tutorial...woohooo...or should I say hoot hoot...lol. Jenny the Artist has the tutorial and pattern here. Pop over to my Sew Prim Blog and take a look at my cute owls. Now this little owl purse would be really cute in some nicer fabric than the original is made in. A cute Owl Swag tutorial can be found over at Moonstiches. This is a really cute owl tote bag tutorial. I love it but not sure if I love owls enough to carry it around. Lucky Kate Crafts has some cute tutorials on a few things...I love the owl egg cosy for one thing. She has a little robin, a jam jar topper and a few other little things. The Vintage Moth has free vintage graphics for all kinds of use so take a look if you are into vintage. aldas GePatcHTeS und GeSticKteS has a sheep pincushion with a scissor holder on her blog with a PDF pattern in German and English.....she also has some nice quilt tutorials and a tablerunner there too. The Graphics Fairy has free vintage graphics that can be used for all sorts of crafts or for your blogs. A Thread of Red has a terrific patchwork Scottie Dog blog tutorial...so go grab it you scottie lovers...or just dog lovers. Moda Bakeshop have a cute Book Keeper to make...I love these fabrics. Thanks to Janet for sharing this lovely blog with a journal cover and tote bag tutorial over at Bloom and Blossoms. There are a few different pincushions found over at Quilts A Lot to make up. Rhonda over at Down To Earth has some great homemade cleaning recipes for anybody interested. She also has a beginners bread making tutorial and lots of other tips and ideas. United Notions has a great hexagon pincushion that I am going to have to make real soon. I love hexagons and this is a nice size too. There are lots of other patterns here too. Mainly quilts and bags. The Golden Thimble has many different links of all sorts of free patterns and tutorials. So many that it seems like you could spend the year sorting through them...lol...maybe one day....but I thought I would add this to the blog anyway in case somebody has plenty of time to do it. Let me know if you come across something really good to do a separate post on it....thanks. Patchy Work of Mini Grey blog has a tutorial for a nifty "slice and dice" patchwork block. Jodie over at Javajem has a tutorial for a zippered wristlet...nice little purse to carry around. All Stitched Up have a tutorial for fabric coasters to grab. Linda over at All Stitched Up has a terrific tutorial for a stitching folder. Take a look. You could use it for any type storage folder as well. There is a cute Ladybug pincushion can be found over at WhipUP. Some free prim patterns can be grabbed over at Annies Cupboard. I like several of the Annies she has and there is a snowman, christmas tree and some other freebies. Some great prim stitcheries to grab over at Prim Patterns n Handmades. Just perfect for those prim projects they can be stitched, appliqued or punch needled. Sarah's Prim Treasures has an One Hour Bag tutorial if you are needing to whip up a bag quickly. Debbie Mumm has a lovely springtime table topper along with other projects here. With Needle and Thread have many many blocks that you can print off to stitch, embroider, applique or even paint. Take a look here. Country Calender BOM can be found over at Ellies Quilthouse. You can find some lovely quilt labels here. All People Quilt have a tutorial for a tote bag here. This Messenger Bag would make a great laptop bag. Seems to be the correct size for my laptop. Geta's Quilting Studio has a tutorial to make a quilted bowl...this is great...I would love to try this. The Humble Arts have a free prim stitched tag with a chook. They also have tutorials and in the archives they have some more free stuff for you prim lovers out there.